Above, the current production fluted heavy barrel Ithaca Deerslayer III: one of the current breed of slug guns that has made 200 yard deer-hunting, with confidence, a reality under ideal conditions. Slug guns have come a very long way recently, helped in a big way by improved saboted ammunition. Once considered just about the lowest form of firearm that could possibly be used for deer hunting and a favorite of slob hunters from coast to coast, the landscape has changed quite dramatically. Shotguns are generally for the birds, as they say, but due to recent advancements in firearms and ammunition this is not strictly true at all. Gone are the days where lobbing a Foster slug out of a Winchester Model 12, trying to hit a pie plate at 25 yards by shooting off the bead was as good as it got. That's a good thing, at least as far as I'm concerned. Buckshot has its place, but hunting big game isn't one of them. Buckshot has been a sloppy, horrible crippler of medium to big game as long as I can remember. The number of deer that are found, eventually, rotting with partially healed buckshot wounds is something once you've experienced you'll not soon forget. What it may do to deer is lamentable. What it has done to tougher animals, like black bear, makes it a joke-- and not a good one. One bear in particular we took had 25  30 buckshot holes in him, with pieces of 00 buckshot still in the hide. How many times this fifteen to twenty year old bear had actually been shot with buckshot over the years is anyone's guess. What isn't a guess at all is how ineffectual it was on all of these occasions, serving only to wound the bear, wounds the bear recovered from. Buckshot has no place for any hunter that considers themselves a sportsman. A round ball is the worst performing projectile there is. Short range deer hunting has been done effectively by .54 caliber muzzleloaders, with .36 caliber round ball rifles considered Squirrel Rifles. Small wonder that a low velocity round ball of .33 diameter weighing about fifty-four grains is a horrible thing to do to a deer. Brown Bess, the nickname for the smoothbore Land Pattern muskets from 1722 onward were .75 caliber. Those familiar with James Fenimore Coopers' The Last of the Mohicans: A Narrative of 1757 will note that in the aside from Brown Bess, the French contemporary firearm was the .69 caliber Charleville musket. The Charleville was in service from 1717-1839. Even three hundred years ago, it was universally recognized that to make a round ball work it needed large diameters. Brown Bess threw a 545 grain ball at a muzzle velocity of around 1000 fps. If you've not guessed the connection between the French and Indian Wars, the Revolutionary War, and slug guns you'll note that these wars were fought with weapons closer to 12 gauge smoothbores (.729 in. nominal) as much as anything else. That's closer external ballistics than could be hoped for if we did it intentionally. As for what actually hits the target, it is a 273 grain grain .45 caliber bullet in 20 gauge as opposed to a 328 grain bullet in 12 gauge. I've not measured the 12 gauge projectile, but I'll guess it is a 50 caliber. The launch velocities are the same in either case, the ballistic coefficients are virtually identical as you can see by the virtually identical trajectories. 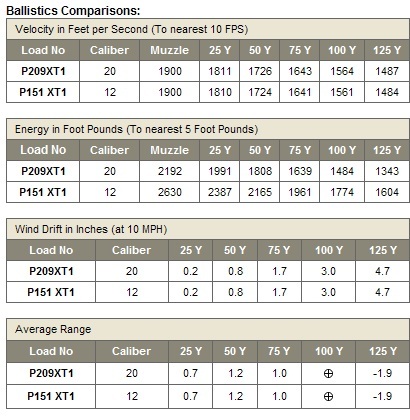 In terms of whitetail lethality, the difference is one of trivia. You can say that, yes, the larger diameter bullet will make a slightly larger hole. It is trivia, though, in the same sense that a .30-06 would be more lethal on deer-sized game than a 7mm or a 270 Winchester. I've taken most things that can be hunted with hooves in North America with .50 caliber muzzleloaders throwing .45 caliber Barnes bullets. The idea that doing the same thing with a .54 caliber muzzleloader throwing a .50 caliber bullet with a pretty, purple MMP sabot would have a different outcome is not a sustainable one. If it was, .54 caliber inline muzzleloaders would be common. That they are almost non-existent should tell you something. All a 12 gauge gets you in a rifled slug gun, with this load is more recoil than a 20 gauge. No advantage whatsoever in ballistics or lethality for today's deer hunter. So, the 20 gauge must be superior? In the case of an Ithaca DeerSlayer II, the 20 gauge weighs 6.8 pounds catalog weight vs. 7.6 pounds for the 12 gauge. In the example of the Ithaca Deerslayer III with the fluted, heavy wall barrel, it is 8.1 pounds with scope in 20 gauge compared to 9.5 pounds (again including scope) in 12 gauge. 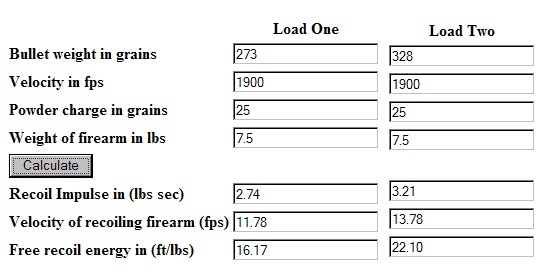 The heavier gun weight serves to mitigate the extra recoil. You may prefer the handling or feeding characteristics of the 12 versus the 20, or vice-versa that might cause you to prefer one over the other. The redux of the Browning A-Bolt slug gun is in 12 gauge only, so if the A-Bolt is what you want you don't have a choice of gauge. In general, yes, the 20 gauge is the better platform for rifled slug guns for deer. That may change, though, based on future ammunition and rifle advancements. As always, the individual likes what he likes. If you like it or if you don't, you're always right. 2014 Update: But, now four years after the orginal article, the 'new' Browning A-Bolt has already been discontinued, and 20 gauge slug guns have increased their lead. With the right ammo, it is hard to find a 20 gauge Savage 220 or Ithaca Deerslayer that won't shoot inside 1-1/2 in. at 100 yards. Copyright 2010, 2014 by Randy Wakeman. All Rights Reserved.